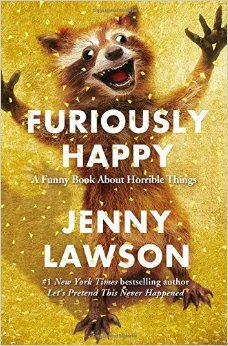 Furiously Happy: a funny book about horrible things by Jenny Lawson is an open, revealing book about and by a woman is who is determined to find happiness in life despite battles with depression, anxiety, arthritis, ocd .... Lawson takes the good moments and makes them joyful and makes the more challenging times funny. Lawson is known to many as "The Bloggess" and has been sharing her stories and her insights on mental illness and life in general in a darkly humorous and brutally honest way. 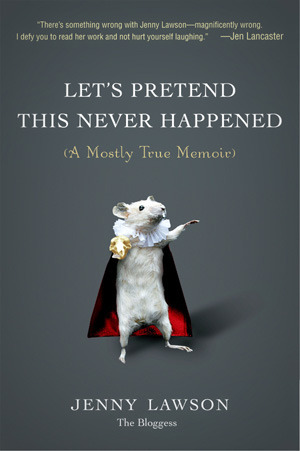 In her first book Let's Pretend This Never Happened (a mostly true memoir) Lawson shares tales about her early life in Texas and her somewhat dysfunctional family. The racoon on the cover of her latest book is Rory - a taxidermied (is that a word?) racoon compliments of her taxidermist father - who appears to have found a new "life" in a Flat Stanley kind of way. Lawson writes with her filter off which have caused some reviewers are saying that her book is uneven, cringey and uncomfortable. It is this total honesty and candor that has made her such a successful blogger and has driven her books to the best seller lists. Library Journal wrote: "The stigma surrounding mental illness can only be lifted if people affected are willing to talk about their experiences and everyone else is willing to listen. This book is a profane, hilarious, touching, and essential part of that conversation."